WASHINGTON -- In 2003, the Navy began offering a new short-term two year enlistment program aimed at expanding the opportunities for all Americans to serve in the United States Navy. In this article - MILPERSMAN Article 1133-080. This was also at the height on the build up of the invasion of Iraq and the entire Department of Defense saw a need for more personnel in the military. The two year option gave many young Americans who wanted to serve the quick ability to be in the military and test the waters to see if a career in the military is an option for them. The college education benefits were also available with this two year enlistment option as long as the recruit met the high standard for the program. Though there has not been an official replacement of the Navy's Call to Service, it appears that the two year enlistments are harder to get even after 16 years of war since September 11, 2001. These enlistment programs can easily ebb and flow with the needs of the Navy in order to fill critically needed job skills. If you are still considering the shorter enlistment over the traditional 4-6 year enlistment, ask a recruiter as the programs change quicker than articles on the internet do. 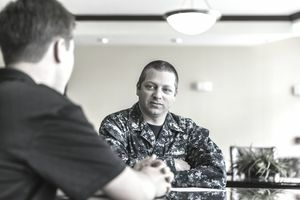 Known as the National Call to Service (NCS), the program provides the Navy and the other military services a new way to reach a group of young Americans who otherwise might not serve in the military because of the length of traditional enlistment options. Editor's note: As part of the FY 2003 Military Authorization Act, Congress mandated that all of the military services implement the National Call to Service Program. The program works like this: A recruit enlists under NCS and incurs a 15-month active-duty service obligation following completion of initial-entry training. The 15-month obligation begins after a Sailor has completed his or her respective Navy School. Navy Schools can run from three-months to 18-months depending on rating. Following successful completion of active duty obligation, Sailors may re-enlist for additional active duty or transfer to the selected reserve for a 24-month obligation. Upon completion of service obligation, Sailors may remain in the selected reserve or transfer to the individual ready reserve for the remainder of an eight-year national commitment. While in the individual ready reserve, these young people will be given the opportunity to move into one of the other national service programs, such as AmeriCorps or the Peace Corps, and time in those will count toward their eight-year total obligation. "The National Call to Service Program will be limited to high-quality recruits, those with a high school diploma and scores in the top half of aptitude tests," (ie, 50 or greater ASVAB score), said Vice Adm. Gerry Hoewing, Chief of Naval Personnel. "We hope this will make the military more attractive to college-bound youth who might volunteer to take a short period out between high school and college to serve their nation." The option may also attract college graduates interested in serving their country before attending graduate school. Perhaps the largest potential pool for the option are community college graduates who after serving the initial active duty period might use available incentives to enter a four-year school. There are four incentives available under the NCS Program. The first is a $5,000 bonus payable upon completion of active duty service. The second is a loan-repayment option also paid at the end of the active-duty portion. The legislation allows for repayment of up to $18,000 of qualifying student loans. The final two incentives are tied to, but not part of, the Montgomery G.I. Bill. One gives 12 months of a full Montgomery G.I. Bill stipend -- currently about $900 a month. The other incentive offers 36 monthly payments at one-half of the current Montgomery G.I. Bill stipend. "This is a great option for high school graduates or even college students who want to serve the country, see the world and then go to school," Hoewing added. Each service will set their own enlistment criteria. The first people who opted for this program entered the delayed-entry program beginning Oct. 1. Basic medical specialties, some engineer skills, personnel, administration and combat specialties will generally be offered. Traditional enlistment terms are three, four, five and six years in comparison to the nominal 15 months of service for the NCS Program. The Navy intends to recruit and select up to 1,000 Sailors for this new national service program.